What’s a parent to do? To schedule or not? To relax or worry? Oh and if you’re not done reading, I have another book to recommend, Madeline Levine’s book, The Price of Privilege, How Parental Pressure and Material Advantage are creating a Generation of Disconnected and Unhappy Kids. I definitely want to avoid kid-unhappiness and disconnect, so I read it. Levine bases this book on her experience and work as a psychologist in Marin County, CA. Because she lives in an affluent area, many examples just don’t apply to my life. The pressures brought by private schools, tutors, private club sports? I don’t have these problems, but I can still relate to the message that kids feel pressured by their parents to achieve and they can’t always handle it. Wait, I’m already confused? Am I supposed to sign my kid up for a bunch of sports teams so they don’t become obese, or not schedule anything so they don’t get stressed out? How do I find the right balance? How do I choose an activity that’s right for my kid and allows a relaxed family environment? In our family, we choose the relaxed approach for just about everything in our life. From work to travel to how we spend our free time, we’ve deliberately removed ourselves from the proverbial treadmill. We choose to keep our life in a relaxed and balanced state. And that means saying ‘No’ sometimes. We learned when the kids were very young, that too much stimulation is bad and our kids need a lot of down time. They crave time to relax and read and create and just chill. We’ve built exercise into our daily routines by choosing to walk and bike for transportation. Even so, our kids want to play sports and do stuff with friends. We don’t shun all activities. Even for us, the bike family, daily exercise is something we have to plan. We only live five minutes, and five blocks from school. If our kids are supposed to get an hour of exercise a day, we have to come up with something in addition to the daily walk or ride. 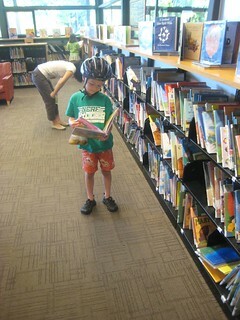 And as I’ve said before, our kids like to read just as much as we do, (competitive reading club, anyone?) so sometimes force them to go outside. Sports teams, with scheduled practices solve the exercise issue for us. (More on this later). Before we talk about choosing activities and how to get our kid to practice, I wanted to mention just how early some parents start signing their kids up for activities and start driving them everywhere. Here’s a sample of some class offerings available in Seattle. Let’s skip the more pedestrian classes like music and art, or sports. Snore, how boring. Or, if your kid is a budding chef, there’s always cooking class. Sign me up! Sounds like fun, get in the car kids, it’s time to go! Don’t get me wrong, classes and activities aren’t all bad. Some of them are super fun. I know parents have varied reasons for signing young kids up for classes. Maybe they just need an hour break and want someone else to entertain their kid? Or a friend is taking the class and it’s more of a social thing, kids play, moms or dads chat, wins all around. If you’re in if for childcare or entertainment, great. No judgement here. But it is easy to see how classes, starting at an early age, rope families into a class cycle. Before anyone realizes how it happened, kids are hooked and parents feel trapped in the car. We start to believe classes are necessary and that driving kids everywhere is a parental requirement. Jokes aside, I do worry when parents use activities, sports and college in the same sentence. ” what about soccer? I need to get him into classes now or his skills will not properly develop. If I don’t start soccer classes when my kid is 2, 3, 4, how will he make select when he’s 8? And if he doesn’t play select, there’s no way he’ll make the high school team. And what about college? He surely won’t get a college scholarship. Crap, he might not even get into college. Or get a job. He’ll be living with me when he’s 40. I have to sign him up, I want to give him a leg up. Ack! I exaggerate (a little). I’m not that neurotic. But I did fall into the activity trap when my kids were young. I willingly gave many hundreds of dollars to Arena sports (I won’t divulge how many hundreds they received or Tim will be pissed!). This all started when our daughter was 18 months old and I thought toddler soccer was so darn cute. The littles running around, the parachute, the songs. Adorable. Unfortunately soccer classes continued for a few years after it stopped being cute and got more and more expensive for not much benefit. Why did I think that was a good idea? I play soccer, why didn’t I just take the kids to the park more often to kick the ball around? They’d get more skill development out of that. Why? Because all the other parents were doing it. So naturally I thought I should too. Parents talk about their kids and various activities all the time. If your kids don’t do anything, you start to feel like a slacker. Then the little voices begin jabbering away in your head…I’m holding my kid back, they’re going to fall behind, they have to start (insert sport) now or soon it will be too late, and all the other kids will be so far ahead, my kid will never catch up. Even though some of that is true, I don’t buy into all of it. This is just a classic case of peer pressure, right? So maybe you’re not into circus classes, and maybe you resisted all of the baby classes. But by the time they get to elementary school, your kid will most likely want to do something. How do you choose what activity to start? Let your kid decide what they want to do. (and if they don’t pick anything I’m not above forcing them to try something). If I didn’t make my son get outside, he would gladly sit around and read, draw and play games on the computer every single day. We definitely force him to do things sometimes. At least when you’re forcing them, you can can pick the location and make sure you avoid lots of driving! Let’s go back to the NPR health story, The main message of the story surrounds childhood obesity and the different approaches parents employ to help their kids exercise. In the interview, we heard about the car way and the bike way. One mom, Yvonne Condes, of LA, drives both her kids to various practices, sometimes sitting in traffic for 25 minutes to get her kids to baseball and basketball practice. Yvonne Condes is definitely a slave to her car. After all that driving, she has to catch up on work in the evenings, sometimes until 11:00/12:00 at night. But she thinks it’s worth it, in her words, It’s all for the kids. Martina, on the other hand, builds exercise into her daily life. Exercise happens every day, doing things like getting groceries or walking to school. If her kid does an activity, she deliberately chooses close-to-home activities. Hmm, sounds familiar. Her kid bikes/walks every day, and she doesn’t have to worry about whether or not that’s enough exercise. Daily exercise is just part of daily life. And as Martina notes, lifestyle is all on purpose, she’s designed her entire life from job to home to school around the bikability and walkability of all life’s necessary services (food, clothing, fun). Why would kid activities be any different? The bonus of this whole-life approach to exercise, using bikes for transportation and walking, it allows the entire family to exercise in the process of going about our daily business. How do you find Activities that are close to home? Ask other parents who they recommend. Word-of-mouth is really the best way to find a teacher, class or team sport that is good. Community Centers, Local Parks Departments for the win: If you live in an urban, suburban area or town with community centers, or local parks department, you’re likely to find activities close to home. You just have to look. Can I bike or walk there? When you’re a biking/walking parent, your very first question should be, “Can I bike there? Do you know of a teacher/class that is biking distance from here? Ignore the other parents. Who cares if your kid’s friend, Johnny, found an amazing karate studio in West Seattle and he wants your kid to join him. These opportunities will come up, and you have to stand your ground and insist that all activities are close to home. Your kid will understand and you’ll be relieved, promise. Your choice may not be “the best ever” Yes, the dance studio across town might be “the best in town”, but can’t you just try your local community center first? If your kid ends up being Joffrey worthy, you can always try a better studio when they’re older and after they have a few classes under their belt. I guarantee, when kids are two and three and four and five, splitting hairs about the quality of instruction really doesn’t matter much. For all the parents out there, have you fallen into the kid activity trap? Have any funny stories about classes your kids have taken? How do you deal with bikes and kids and activities? This entry was posted in bigger than here, bikes, kids, neighborhoods and tagged activities, exercise, family, kids, schedule, sports. Bookmark the permalink. We’re starting to figure that out for ourselves now as E is just starting to get involved in stuff. So for us, swimming, yep we want our kids to be comfortable in the water, it’s a bit far but a priority for us. Ballet, she loved it before and is indifferent now so we might drop that soon, on the other hand it’s close and ok exercise for her. As far as the rest, we dropped yoga due to her lack of interest and snobby parents and a busy road. But we tend to do more in the winter since parks get very icy around here. We cut back in summer and have more free play time. Papabybike, Thanks for your thoughts! Dabbling is a great way to figure out kid’s interests. And I hadn’t even thought about climate, scheduling is probably necessary when you live in a cold winter climate! We’re spoiled with our temperate NW winters, we may get wet, but it’s never too cold to go out. We’re looking forward to summer and free play! We’re fairly new on car-free lifestyle (6 months), so we’re still working out our son’s actvities. We homeschool. The library offers a wide variety of homeschool programs. Most are downtown, an easy walk/bike trip from home. One branch has a weekly art class that’s an hour away by bus. As for sports, my son plays soccer. One of the colleges in town had its program for elementary kids in the fall. My wife and son walked or rode the bus up to the college fields each week. As the weather warms up, I’m sure we’ll spend time bicycling together. Mike, Thanks for the library reminder! 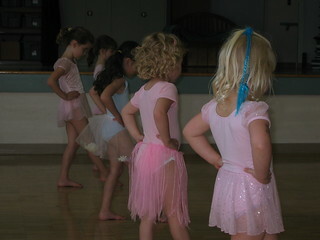 Ours has great classes and activities too. And it’s walkable/bikable from home. Just recently started going car-free (and blogging about the experience at carsarevile.blogspot.ca), and trying to figure out what to do about the summer soccer league for my two boys, it involves a fair bit of driving to ‘away’ games. Thanks for sharing your ideas. Hi Ed, Sometimes you can’t avoid car trips. If you don’t have a car, you can try to hitch a ride with someone (at least for the kids) to away games. So many parents are driving anyway, it doesn’t hurt to ask for a ride. Or if car-sharing (Zipcar, car2go) is an option where you live, you can always get one or for away games. Weekend car rentals are cheap – that’s an option too. 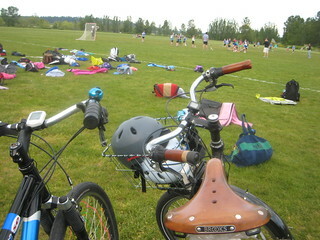 My daughter is playing lacrosse and her awesome coach (who bikes for transportation too) drives to practice because she has a ton of equipment to haul. Since she’s driving anyway, she loads up her van with kids to reduce the number of cars going to the same place. We’re so grateful that she drives our daughter to practice! If you can find someone who’s willing to drive your kid, shower them with appreciation and gifts!